The Duke's Course in St. Andrews, Scotland opened in 1995, but it's practically a whole new golf course, having received a huge makeover after U.S. golf mogul Herb Kohler bought the Old Course Hotel in 2005 and made the Duke's the official course for hotel guests. The result is 116 new or redesigned bunkers that give the course a more ruggled look and feel. The final four holes of the golf course were also redone, making for a more dramatic finish. This is an upscale, modern heathland course that overlooks the town of St. Andrews and the Fairmont St. Andrews resort. 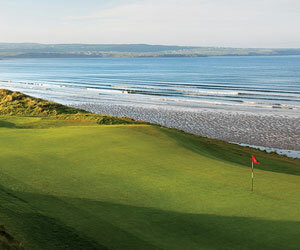 The view from the Duke's Course takes in the town of St. Andrews and beyond to the sea. The Duke's opens with a 528-yard par 5 lined with fairway bunkers. The first green at the Duke's Course, St. Andrews. The 116 new or reshaped bunkers give the Duke's a more rugged look and feel. An expanse of sand guards the third green. The brand-new 15th starts off the Duke's redone closing stretch. The 16th is another new hole at the Duke's Course.